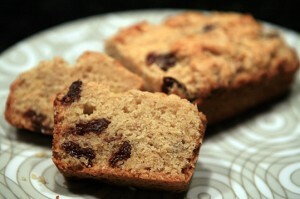 It doesn’t matter where I go, banana bread is always a huge hit. Sweet and moist, it’s perfect for breakfast, a snack or dessert. This treat will not only curb your sweet tooth cravings, but cherries are full of antioxidants, which are perfect for helping you stay in shape throughout the summer months. Preheat the oven to 375. Spray 3 muffin tins with non-stick spray. Add bananas to a large bowl with honey. Mash the bananas and honey together with a fork until the mixture become a liquid consistency. Melt the butter in a saucepan over medium heat. Stir every couple of minutes, until it turns a golden brown color. Add about 1 cup of the banana mixture, stir to combine. Cook for 1-2 minutes until the mix turns to a dark golden color. Add the remaining mixture along with the egg, stirring to combine. Fold in the flour. I fold in 3 batches, folding just to combine. Pour the dough evenly into the 3 muffin tins. Bake until golden brown for about 25 minutes. Allow to cool for 5 minutes and serve warm with vanilla bean ice cream.